Eagle Trace at Massanutten is a major East Coast destination resort, providing everything a family could want in one self-contained Four Season vacation package. Eagle Trace belongs to The Great Eastern family of Shenandoah Valley Resorts on the Massanutten Mountainside. The Massanutten complex contains the largest indoor-outdoor Waterpark on the east coast, an ultra-modern go cart track, two indoor pool complexes, two 18-hole golf courses, two separate mini golf courses, two fitness centers, indoor and outdoor basketball, racquet sports and much more. The skiing is great in the winter and the water sports are wonderful in the summertime. Please click here to check current availability or to rent your week. Eagle Trace is one of seven first class resorts located at Massanutten. It has earned the Silver Crown Award from RCI resort. All guests are invited to enjoy all the amenities year round. Beautiful hiking trails and on-site fishing are available. All Massanutten guests are able to purchase an activity card that yields substantial discounts on every amenity available within the complex, and nearby attractions as well. Luxury coach tours to nearby historical sites and Washington DC are available certain days each week. 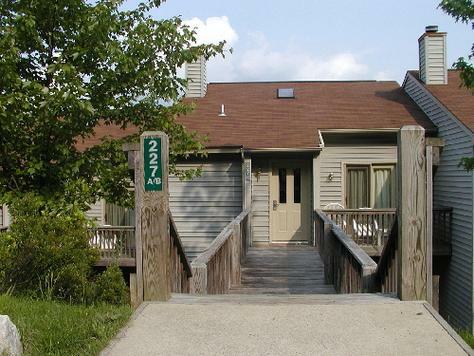 Each Eagle Trace at Massanutten condo is a 2BR “lockoff” townhouse style unit. The 2BR locks off into separate 1BR condos, one downstairs, the “A unit” and one upstairs, the “B” unit. Both A and B units sleep 6 people, have 1 bathroom, fireplace, and are of identical 836 square feet size, but the unit amenities vary a bit. Washer and dryer are located in the entry hallway and are shared by the 2 condos. The units are notable for being especially clean, updated, and well maintained. Condos are situated in clusters, about half on the “Hill” and half in the “Valley”. Again, the condos are identical, except “Hill” units have better views. “Hill” units have Saturday check-ins and “Valley” units Sunday check-ins. We no longer own at this resort. The prices shown are the TOTAL prices. There are NO additional charges (such as sales or lodging taxes, cleaning fees, deposits, booking fees, etc.). The price you see is the price you pay! We have made renting a week fast, easy, and most importantly, safe! You won’t be reading the numbers off your credit card to some stranger on the phone (who knows where those might end up?). A tradition of excellence continues at Eagle Trace at Massanutten. With two quad chairlifts and a vertical drop of 1,110 feet, Massanutten’s ski area offers a thrilling challenge for downhill skiers and snowboarders. Also on site, enjoy two extensive sports complexes with an indoor pool, gymnasium, racquetball courts, exercise equipment, steam room, sauna, massage services, and children’s programs. The Massanutten Water Park offers endless wet fun, and was recently rated among the Top 10 WaterParks in the US by MSN. Surf The Pipeline, drop the kids off at The Frog Pond or Shenandoah Cove, run the Blue Ridge Rapids, dare to ride the tube or body slides. Take a turn at our ice skating complex. In summer, enjoy the outdoor pool and tennis courts. Visit the golf pro shop and 18-hole, PGA-rated or 18-hole executive golf course, putting green, and driving range. Try mountain biking or fishing. The resort has free wifi wireless internet access in most timeshares, and a business center in the Woodstone complex.